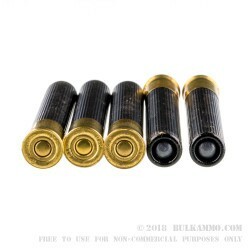 An exceptional deal on 3 inch .410 shotshells that are uniquely suited to home defense and short to intermediate range threats. 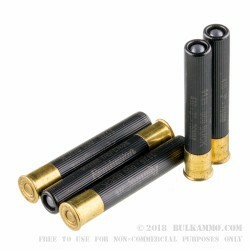 This is a 150 round case lot of powerful .410 cartridges that combine a low flash powder with a 5 pellet #000 Buckshot payload for a very strong first shot stopper. These loads are well suited to pistols made for the .410; specifically those that need a lower recoil (relatively), and still need a strong impact on target at short ranges. The 1125 feet per second velocity is fast enough for adequate penetration on most targets, and still not too fast that it creates an undue risk for overpenetration. 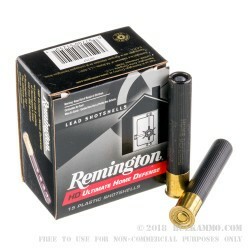 Remington has an extensive portfolio of shotshells made for a variety of purposes. This is among their most specific loads, made specifically for home defense, with attributes that contribute to the most effective performance in shorter distance engagements where massive stopping power is needed, but where friendly fire cannot exist. 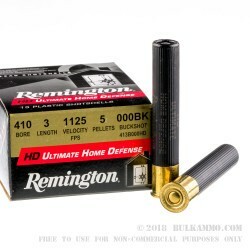 Technical aspects like low flash powder and high brass bases make sense and contribute to performance, but Remington’s build quality and reputation for consistency and reliability are equally important for a load like this.